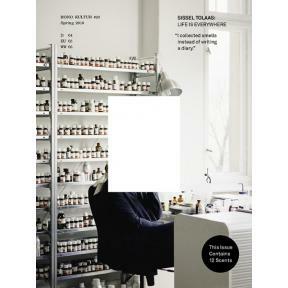 Norwegian scientist and artist Sissel Tolaas has dedicated her life and work to the world of smells. And we don’t mean scents and perfumes, but literally smells – the smells that surround us, everywhere, all the time. Tolaas is interested in what these smells can tell us about our environment, in historical, political, economic and social terms. And how we could make not just the world but our own lives a richer and better place if we chose to pay more attention to our sense of smell. Meanwhile, Sissel Tolaas is a phenomenon in herself: born and raised between Norway and Iceland, with degrees from Scandinavia, Poland and Russia in sciences, chemistry, languages and fine arts, Tolaas has become an expert on everything related to scents, odours, smells. She is a professor at Harvard University for invisible communication, while working on hospital and research projects as well as for commercial clients such as Adidas, Louis Vuitton and Ikea; while exhibiting the results of her research in museums such as the MoMA New York, the National Museum of Beijing or the Hamburger Bahnhof in Berlin. A vibrant and determined character with a unique expertise and biography, Sissel Tolaas is everything we could have hoped for in our latest issue. With mono.kultur, Sissel Tolaas talked about why she is tired of words and images, her turbulent time as a student in Communist Poland and how smell might change your life. Forgive us for our self-flattery, but it has to be said that mono.kultur #23 is a gem of a magazine – the issue contains no visual imagery but clears the page for our most primary sense: the magazine will be impregnated with 12 scents curated by Sissel Tolaas. And you might have gathered by now that we’re not talking about perfumes either, but what Tolaas would coin ‘difficult smells’. With a special technique called microencapsulation, the scents are literally printed into the magazine – you rub the paper to release them.